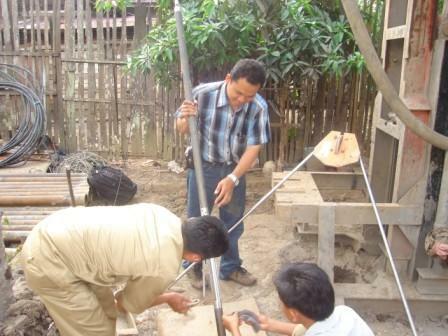 The Delta Epsilon family of portable borehole loggers offers a combination of uncommon capability, ruggedness of design and ease of operation. Based on a legacy of building loggers in use around the world for more than four decades, a DEI logger is a superior working tool for the earth scientist and explorationist. 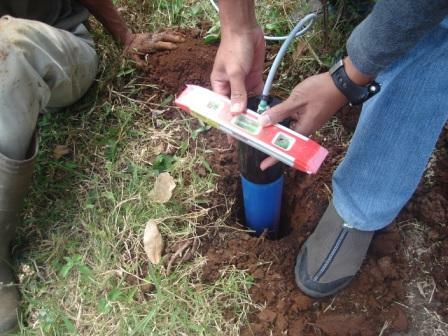 The portable loggers system features an integral data acquisition and uphole power unit. Delta Epsilon offers an extensive array of digital probes that facilitate the efficient and economical exploration of drill holes. 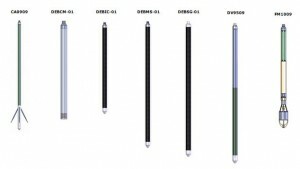 Delta Epsilon probes are commonly also used in minerals exploration, groundwater exploration and development, environmental assessment, geotechnical applications, and general geologic studies. 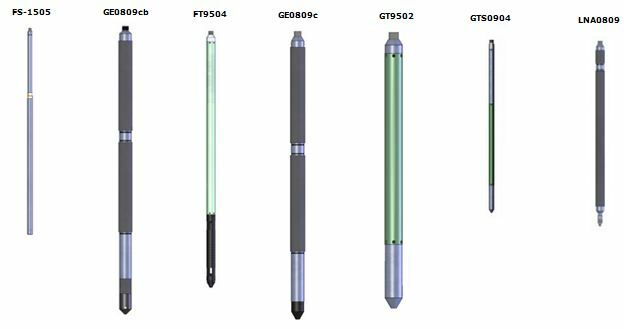 The uphole data acquisition system supports an extensive group of digital downhole probes that facilitate the efficient and economical exploration of drill holes. automatically correct for two major factors that otherwise introduce substantial error in ore grade assays from gamma logs. The first is deadtime and the second is for “Z-effect,” with soon to be introduced filtered gamma tools for applications requiring the assay of Uranium ores above .5%eU308. 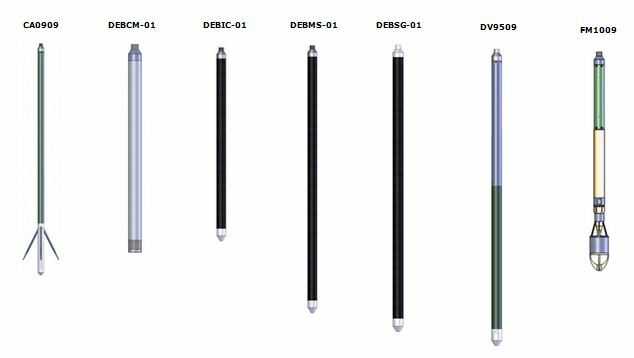 Additionally, probes available for Delta Epsilon loggers are commonly used in groundwater exploration and development, environmental assessment, geotechnical applications and general geologic studies. 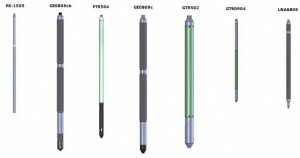 A particularly capable probe for these applications is the GE0809cb combination probe for the simultaneous logging of Gamma, SPR- single point resistance, S.P.- spontaneous potential, as well as Short and Long Normal Resitivity measurements. With resistivity logs acknowledged as the foundation of most water, geotechnical and environmental logging, Delta Epsilon has incorporated 16” and 64” normal resistivity logs measurements in a manner that does not require an isolation bridle and can run these logs on standard lightweight .1” single conductor armored logging cable in conjunction with Gamma SPR and SP logs, comprising the GE0809cb combination gamma and electric logging tool. This is in contrast to other systems which of necessity employ an isolation bridle and heavier multiple conductor cable. This can often mean that electrical data is not obtainable from the upper part of the hole. Despite the use of single conductor cable, Delta Epsilon is able to obtain valid SP logs in a pure and well-proven manner. This is accomplished by completely eliminating influences induced by the necessity of sending power downhole and multiplexing. DEI uses the cable only as a conductor to surface electrodes for this measurement. Delta Epsilon has formed a strategic partnership with a well-regarded global supplier of slim hole logging equipment. This arrangement will permit Delta Epsilon Loggers to run not only the range of tools of our own design but also many of those offered by the strategic partner. WINCHES: Winches often have to function in a wet, abrasive and corrosive environment. All Delta Epsilon winches are constructed of lightweight, corrosion – resistant materials. All bearings are sealed and require no lubrication. Most exposed surfaces are finished with a durable powder coat or hard anodize. 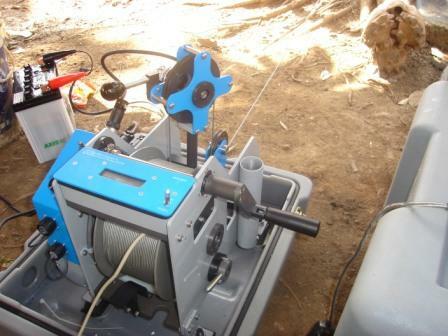 Winches for portable loggers tend to be viewed as generic devices that merely lower and raise a probe in and out of a borehole. This is only partially true, for how well they perform this deceptively complex function will in many respects determine how satisfactory a logger is to use. All Delta Epsilon winches are characterized by fine machining, smooth and precise operation, practical rugged design, and attention to significant operational details. All Delta Epsilon winches incorporate a mechanical brake and an integral clutch to insure that probe descent is controlled. When logging uphole, if upward progress is stopped for any reason (loss of power or mechanical failure etc. ), the probe absolutely cannot reverse direction or “run away.” It is also possible to precisely stop the probe at an exact spot in the borehole without it reversing direction or creeping backwards. Delta Epsilon winches also incorporate a unique feature to prevent inadvertent back lashing or “birdnesting” of the logging cable on the winch drum, which is a common, potentially catastrophic and very unwelcome event on many competing loggers. to run even though tension on the cable ceases for any reason, such as downward progress of the probe stopping because of an obstruction or “bridge” in the borehole. 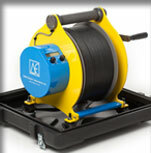 Delta Epsilon winches will only spool off cable if there is tension on the cable. It also permits easy set-up of the logger and tripod at the borehole by one operator, which is problematic on most competing systems if the logging system is even a moderate distance from the borehole and logging tripod. 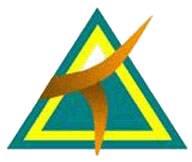 Delta Epsilon Instrument Corporation (DEI) personnel have broad knowledge and experience in the logging industry. DEI president, has more than thirty years experience in the design, manufacture, sale and support of instruments for uranium exploration and exploitation, both in surface and borehole applications. And the scientific advisor and Principal Investigator has worked in nuclear logging for most of his 35-year professional career. He was a senior member of the team that developed the spectral logging (KUT) technique. Environmental Storage/operating Temperature Range: -20o C to 45o C (-4o F to 113o F) for 300-1E winch. Relative humidity: 5% to 100%, non-condensing. With cover in place either winch will with stand a 76cm (30″) fall onto concrete. Opt. Power The 300-1E requires an External Source of 11 – 14.5 VDC Power. 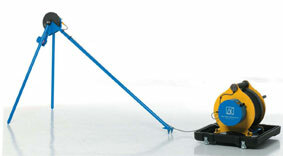 Levelwind Semi-Automatic – Operator Assisted – levelwindmechanism allows wrapping the cable evenly across the drum. Motor Permanent Magnet D.C. Motor and ContinuouslyAdjustable Speed Control. The controller is equipped with a Modulated Dynamic Brake to hold speed constant while moving downhole. The motor can easily be disengaged to “free wheel” Downhole or to use the hand crank (4:1 ratio). Disc Brake A Disc Brake, coupled through an overrunningclutch, allows controlling cable speed in the down direction. With the brake set, the operator may winch the probe up hole and release the hand crank without worry of the probe free wheeling downhole. All the rocks and soils of the earth are to some degree radioactive. 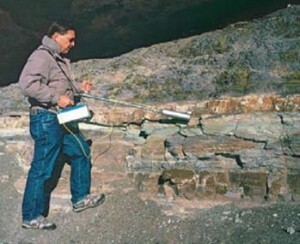 The measurement of radiactive across the surface of the earth constitutes a method of geophysical exploration of prospecting and in some instances, environmental monitoring. The measurement of beta and alpha particles are in many istances impractical due to their limited range and low energy. 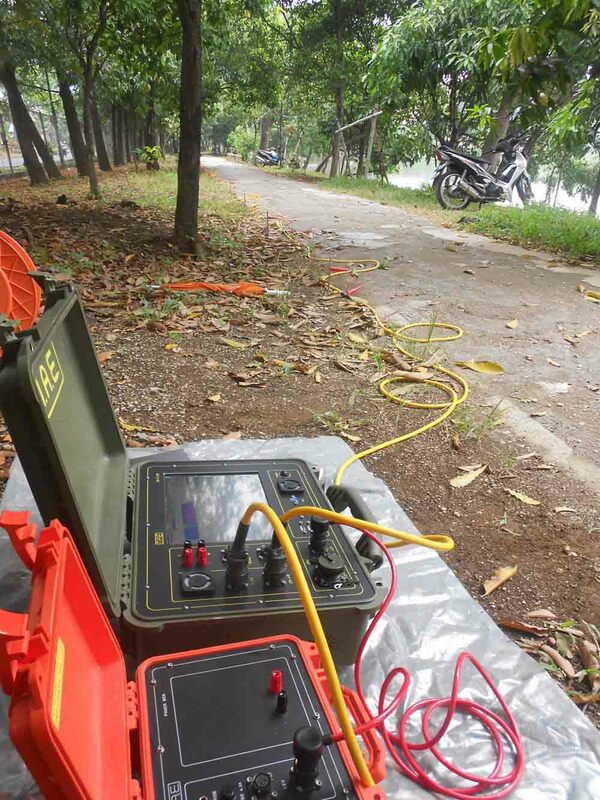 Gamma radiation, however is emitted by some of the products resultinf from the disintegration of U238 and may be readily detected with suitable measuring instruments such as scintillometer. represents a functionally superior concept for a hand held gamma radiation detection device. 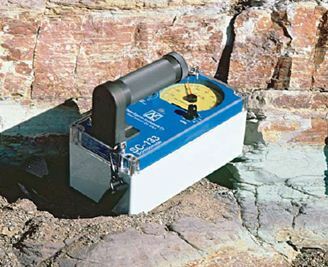 Its rugged practical design, simple operation and high sensitivity make it well suited for uranium exploration applications as well as environmental monitoring and health physics dosimetry. It has also been designed to meet or exceed the ANSI N42 standards for hand held inspection and interdiction instruments for Homeland Security and Nuclear Safeguards. 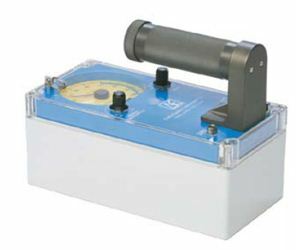 also incorporates features proven to be invaluable based on a legacy of decades of experience by the principles of DEI as manufacturers of thousands of scintillometers. Additionally, the input from significant end-users in a variety of demanding circumstances was considered in the design of the instrument. that convey both operational and performance advantages that are not available on any competing instrument. The SC-133 represents the utmost in ruggedness, sensitivity and versatility available in a scintillometer on the world market today. The end result is an unmatched degree of user functionality in an instrument that is also exceptionally tough and dependable. HYBRID COMBINATION DIGITAL AND ANALOG DISPLAY. Delta Epsilon could have simply used a digital LCD display similar to most other manufacturers. Instead we chose to also develop a very legible and rugged analog meter display to concurrently display data in a more intuitive analog manner. The result is a simple and clear system unique to the SC-133 that intuitively, and at a glance, shows you everything you need to know and nothing that you don’t. In a digital world, the incorporation of an analog display may initially seem dated, but consider the following examples. The pilot interfaces’ of most of the world’s airplanes, including most contemporary jet aircraft are predominantly analog, as are the instrument displays in the world’s finest automobiles as well as faces of virtually all premium quality wrist watches. For precisely determining blood pressure in unstable patients, most Cardiac Care Units use an analog manometer. In the same clinical setting, the readouts for vacuum and oxygen lines are exclusively analog. These examples of analog displays are referenced because of the critical fact that having an analog display is the most effective way to simply convey essential information where observable relative change is the priority. It is advantageous that an instrument intended to convey relative changes in radiation levels in the most obviously intuitive and understandable manner should also have an analog display, rather than just a line of difficult to remember and ever changing digits. The meter on the SC-133 is as easy to read as the hands on a clock without having to mentally interpret and remember sequences of ascending or descending numbers. Two rotary knobs whose functions are self-explanatory control all instrument functions. One knob controls the adjustable audio threshold and optional backlighting while the other controls all other instrument functions. There are no unnecessary modes, functions, flashing LEDs, ambiguous commands or bells and whistles. The SC-133 is a very serious and easy to use working tool. The housing and major components of the SC-133 are either hard-anodized aluminum that has been machined from solid stock or highly impact resistant polycarbonate plastic. The latter is the same material that is commonly used in bulletproof windows and football helmets. This material has superior impact resistance compared to intrinsically soft, drawn aluminum and eliminates the denting and subsequent internal damage common to competing instruments housed in thin aluminum cases. The SC-133 has been designed to withstand operation in the most severe climatic conditions and is completely water, dust and weather tight. The SC-133 can be operated indefinitely in humid or wet climates, survive accidental immersions and be rinsed off in the event of contamination by radioactive dust or mud. The scintillation detector is surrounded and insulated internally with shock absorbing material. The temperature operating range is -20 to + 60 C.
READILY AVAILABLE STANDARD D CELL BATTERIES. The batteries are contained in the instrument handle and are easily replaced without opening the instrument and exposing it to the elements. Battery level is easily checked on the analog and digital display. ABILITY TO SUPPORT A VARIETY OF EXTERNAL DETECTORS. The SC-133 supports a variety of optional external detectors that enhance the versatility of the instrument. These advantages include being able to flexibly place a detector closer to the area of interest. 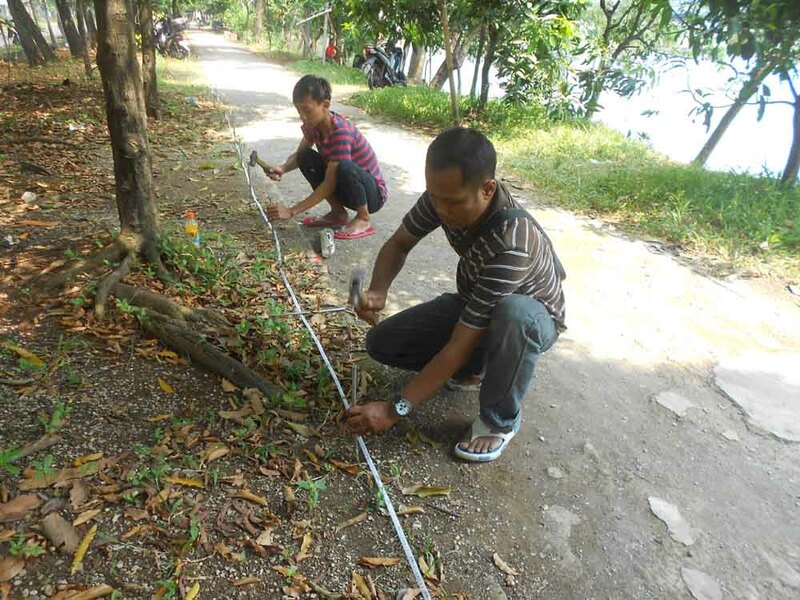 This greatly increases the probability of making a critical detection because of the ability to survey areas that would otherwise be very difficult or inaccessible. 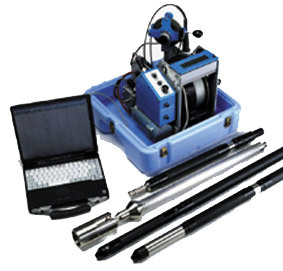 It allows the optional use of much larger detectors than are available for an instrument of this type as well as smaller detectors that may be used in shallow boreholes. A typical example is an 8cu.in.NaI crutch mounted detector assembly commonly deployed on our instruments by the USDOE to survey small amounts of radioactive contamination from dispersed uranium mill tailings. The detector mounted on a modified crutch comprises an ergonomic wand allowing the user to comfortably sweep approximately a three-meter arc very close to the ground. 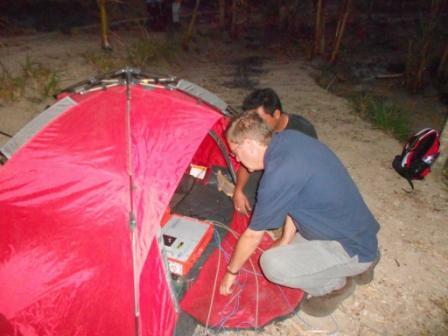 It is also possible to efficiently survey overhead areas in this manner. Even larger external detectors may be deployed for vehicle borne surveys if required. This arrangement is ideal for a variety of exploration and environmental surveys as well as nuclear monitoring orsafeguards. Related applications could include the location and remediation of elements of dirty bombs, fissile material, or fragments of used armor piercing or bunker busting spent uranium penetrators in the aftermath of armed conflict. 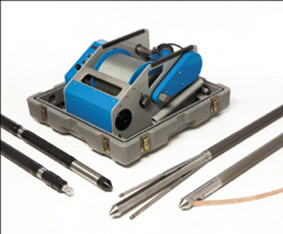 A small probe and cable that permit the inspection of shallow drill holes or “T Handle Probes” for environmental or mining applications are also supported by the SC-133. AUDIO OUTPUT WITH ADJUSTABLE THRESHOLD. gamma intensity. This feature allows “eyes off” operation while the pitch of the audio tone continuously informs the operator of changes in radiation intensity. Both ANALOG AND DIGITAL displays may be backlit for operation at night or in poor lighting conditions. If desired a nonslip shoulder carrying strap may be used which allows hands free operation of the scintillometer. This permits the use of both hands for climbing, taking notes, using a rock hammer, collecting samples or any task that requires both hands. NO RADIOACTIVE SOURCE REQUIRED FOR CALIBRATION OR PROPER OPERATION. High Sensitivity with a large 1.75″ x 2.65″ NaI crystal (6.4 cu. in.) 104.4 cc. This matches or exceeds any instrument in this market class. Even larger external detectors may be deployed as previously described if circumstances demand. LINEAR COUNT RATE TO 100,000 CPS. An automatically dead time corrected counting circuit unique to the SC-133 permits a linear response to 100,000 CPS. As delivered, the SC-133 includes a permanent hard shell, foam lined shipping and storage case, batteries, and optional shoulder carrying strap. Just turn it on and go.